Steering wheel retrim, quick turnaround. 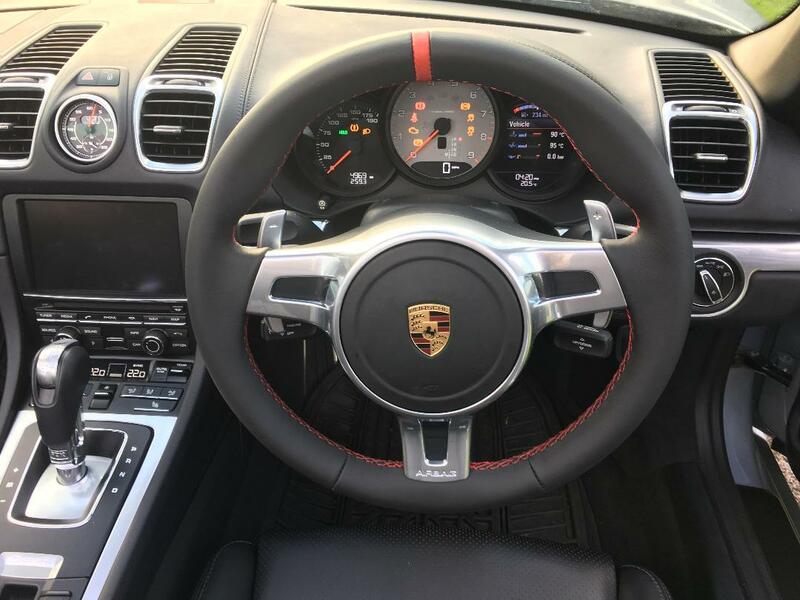 For Herman Yellow, looking to get sports design 991 PDK steering wheel retrimmed (with added girth) yellow stitch and 12 o clock band. Only thing is need a guaranteed quick turnaround by end of November latest and of course a top job! Any ideas? Jack at Royals I assume. This guy did my RS4 one and it was spot on. Alcantara is nice for the first while but when it starts to wear its ugly. Leather stays 'fresh' for much longer and ages more gracefully. Given your re-sale history, I'd suggest leather..
To be fair the mileage will probably never start with a 3 . I’m airing towards leather I think, smart with yellow stitching a the old yellow ring. It’s strange normally when I buy a new motor (which is alot) I look around at others and think cr@p I should of bought that one instead! Not the case with Herman Yellow, can’t find anything I’d rather have! WTF!! Binned him off after his appalling lack of communication. I'll be using this guy for my gear knob. I am with Jonitt on Alcantara , when you clean it it comes up like new, feels great with a better grip than leather . at minimum if you can't bring yourself to go with Alcantara at least consider the 12 o'clock in yellow Alcantara. Alcantara = mole skin, Euughh!! Spongebob I had mine done at royal and very pleased. Have you picked up your car or are you having it done before you pick her up? Thanks for the offer though I think ill live with it and see, I am airing towards alcantara again As I have zero patience I may just wait for one to come up for sale then do a swap. As I have zero patience I may just wait for one to come up for sale then do a swap. What sort of wheel is it? When I got mine done by Royal, I spoke with Jack - he advised taking the trim off the wheel before trimming - costs extra and is really fiddly, but it is the only way to get it right.